The following history was compiled by David Mollenhoff, the Author of "Madison: A History of the Formative Years." Albert C. Stark spent most of his life as a Presbyterian minister serving churches in Iowa and Nebraska. In 1904 he moved to Madison to serve St. Paul’s German Presbyterian Church. In 1908 Stark retired from the ministry and opened a real estate business with a Mr. McLane. They called it the Stark-McLane Land Company and rented a ten-by-twelve foot office in an old sandstone building on Madison’s Capital Square (where Anchor Bank is located today). At first the company sold land in the Dakotas where people of modest means could still buy large amounts of land for relatively little. Sometime in 1908 Reverend Stark asked his son, Paul E. Stark, to join the new company and he accepted. The 23-year-old had graduated from the University of Wisconsin in 1907 and had worked for one year as an assistant principal of a high school in northern Wisconsin. Sometime during the first year, McLane dropped out of the business due to poor health, which left father and son as business partners. To reflect this change, they renamed the firm The Stark Land Company. Beginning in 1910 the company began selling Madison real estate, and by 1912 that was all they sold. Albert Stark remained active in the business until about 1919, but Paul quickly became the company’s driving force. Paul E. Stark loved the real estate business and focused his energy on growing the new company. People were attracted to his quick mind, rugged sincerity, impeccable ethics, forceful but friendly personality and impressive speaking ability. In 1921 the company's name was changed to The Paul E. Stark Company. By 1926 it had become Madison's largest and most respected real estate agency. Stark constructed a new building at 124 West Mifflin for his rapidly growing company, the first time a real estate company had done this in Madison. 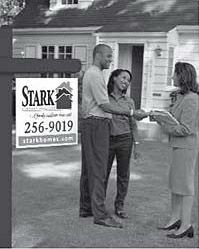 During his early years in the real estate business Stark was troubled by the difficulty many qualified home buyers had in securing a mortgage. Characteristically, he acted while others talked. In 1919 the 34-year-old Stark co-founded the Anchor Building and Loan Association, and for years kept its books in his desk drawer. Later it was known as Anchor Savings and Loan and today it is Anchor Bank. Paul E. Stark quickly became a local, state and national leader of his profession. In 1916 he helped organize and was an early president of the Madison Real Estate Board (now the Realtors Association of South Central Wisconsin). In his work with the board, Stark stressed two themes that marked his entire career: ethics and education. Stark urged fellow board members to attain “the highest ideals of professional conduct,” and in 1919, at Stark’s urging, the Madison board became the first in the country to require its members to pass an examination. Stark also served as president of the Wisconsin Association of Real Estate Brokers and provided active leadership for Wisconsin’s first Realtor® license law. By 1920 Stark was deeply immersed in the affairs of the National Association of Real Estate Boards encouraging states to adopt real estate license laws and helping to reorganize the association. Because of his work in these areas Stark was elected to the national board where he chaired the committee on education-an appointment that allowed Stark to create an outstanding national educational system for practicing Realtors®. That national real estate leaders esteemed Paul E. Stark was evident from his election as president of the National Association of Real Estate Boards in 1937-the first time that a man from a small city had held the top post. Stark also distinguished himself with almost legendary community service. The high-energy broker served as president of the Community Chest (now the United Way), the YMCA, Kiwanis, and the Association of Commerce (now the Greater Madison Chamber of Commerce). He proposed that the UW create an arboretum around Lake Wingra, donated a parcel of land for it, and worked with Madison leaders to create this extraordinary park and research facility. He developed subdivisions (Nakoma, Hillington Way, Virginia Terrace and Eton Ridge and several others) and two pioneering apartment projects. 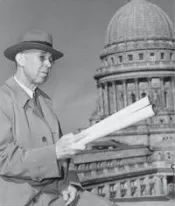 So substantial were the cumulative results of Stark’s civic leadership that he was ranked by Madison Magazine (November, 1999) as the eighth most influential shaper of metropolitan Madison in the twentieth century. When Paul Stark died of a heart attack at the age of 61 on December 13, 1945, his two sons, Phillip C. and Richard P., had just been discharged from military service and were too young to run the company. Consequently, a long-time Stark employee, Walter Schar, was named general manager. Phil, who had compiled a distinguished infantry record in World War II, entered the new UW real estate program his father had helped establish. Upon graduation in 1948 he joined Stark Company Realtors. Richard joined the firm as a sales associate in the fall of 1945, immediately after being discharged from the Army Air Corps. When Schar died in l965, Phil was named president. 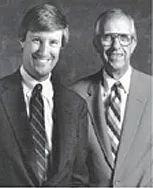 Phil continued his father’s strong emphasis on the highest standards of business conduct, opened a new company headquarters at 717 John Nolen Drive, launched the first two branches, hired a woman to head one branch-a very radical step at the time, and was the first in Dane County to advertise a real estate company on television. Like his father, Phil Stark provided distinguished industry and community service. Top industry leadership posts included the Madison Board of Realtors, the Wisconsin Realtors Association, and the National Association of Realtors. In l988 he received the National Distinguished Service Award, an honor given to just two persons in the U.S. each year. Respect for his astute, quiet leadership prompted Madison leaders to elect Stark to head the Chamber of Commerce, the YMCA, the Red Cross, and the Rotary Club of Madison. David Stark joined the firm in 1978 as a sales associate and after working his way up the ladder became president in 1989. He greatly expanded the size of the company by acquiring four Dane County companies, enriched training programs, and introduced sophisticated computers and programs for sales associates and clients. During the l990s Stark continued to back up sales associates with experienced, full-time, non-selling branch managers. David continues the firm’s proud tradition of industry and community leadership. His top industry posts included the Greater Madison Board of Realtors, the Wisconsin Realtors Association, and the National Association of Realtors. David was elected to lead the United Way, the Meriter Foundation, and the YMCA. What a change a near century has made: from two men in a ten-by-twelve office in Downtown Madison to 200 men and women in six locations in South Central Wisconsin! But some things have not changed. Stark Company Realtors is still family-owned and local. Its people continue to earn public trust one client at a time, provide respected leadership in the real estate industry, and shape the community through dozens of religious, civic, and government bodies.